I’d love to tell you a witty, entertaining story about the inception of this dish but there isn’t one. My life recently has been all about deadlines and decorating and I’m in grave danger of turning into a BOF (Boring Old Fart). If you’d like to know about kippers, racism in food or what to do when the paint won’t stick to the wall, I’m your girl. But if you are similarly pushed for time in the kitchen, you might like this recipe. All the same, the marinade takes minutes to make and when you come to eat, you can have the food on the table in under an hour. 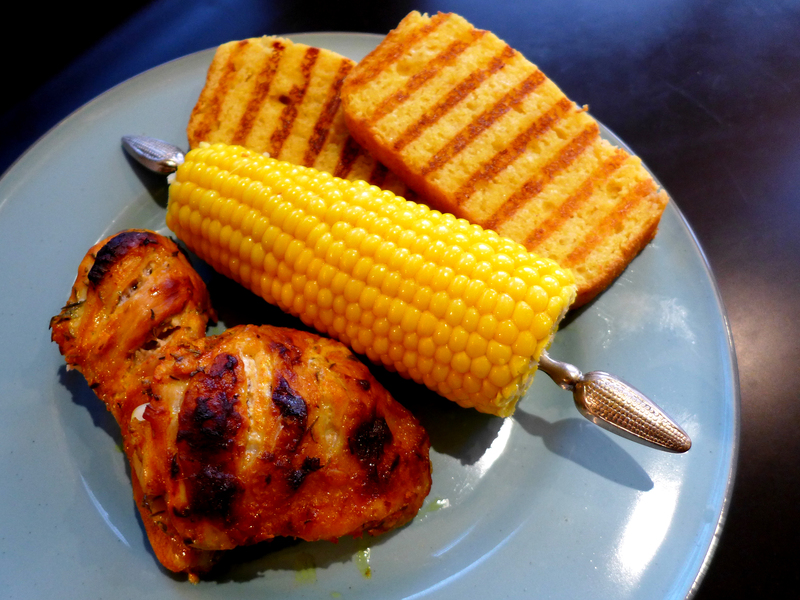 We ate it with sweetcorn and griddled cornbread but if you are in a hurry, try it with a crusty loaf, a salad and perhaps a glass of something nicely chilled and you can chill out too. Any leftover chicken is good cold. For anyone watching their weight, buttermilk is low in fat and a good way to ensure the meat stays moist. Roasting keeps the fat content down too, compared to the traditional method of frying. No diet, however, can make me give up crispy chicken skin. I used cultured buttermilk in this, available from supermarkets, but I’ve just got my hands on some of the proper old-fashioned stuff from Fen Farm Dairy, a spin-off from their raw milk cheese and butter making. Expect a lot of buttermilk recipes in the coming weeks. Whisk together all the ingredients (except the chicken, obvs, and the oil and lemon juice.) Slash the chicken joints fairly deeply with a sharp knife and dump them in the bowl with the marinade, massaging it into the cuts. Cover and refrigerate for around 24 hours. Six hours is the minimum, I’d say, 48 hours the max. When you want to eat, pre-heat the oven to 220C/425F/Gas Mark 7. Shake the excess marinade from the chicken and put it in one layer in a roasting tin, skin side up. Bake for about 35 minutes or until browned and cooked through. Squeeze over the lemon juice and allow to rest for 10 minutes.Skim off any fat and serve the chicken with the juices spooned over the top. This entry was posted in Chicken and other poultry, Mains and tagged roast buttermilk chicken, spicy buttermilk chicken by Linda Duffin. Bookmark the permalink. We are on an extended holiday in America at the moment and buttermilk is everywhere in recipes and on menus. Yet at home I sometimes find it difficult to get hold of. I’ve found it makes the best breakfast pancakes too. Yes, Ina can be overly lavish with butter and cream! I’ll look forward to your version. Oh and @ the lactose issue – I don’t have that problem myself, so I can’t tell you more about the product itself, but I’ve recently encountered a whole range of almond milk-based dairy substitutes, including buttermilk, in the milk & cheese section of an organic foodstore nearby. Maybe it’s worth a try…? Oooh, they’re doing buttermilk now, are they? This sounds good, especially seeing that whenever I have tried frying chicken a la posh KFC it has gone very wrong (think burnt outside, raw middle).